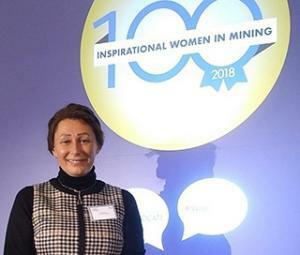 The Women in Mining organisation has recognised the pioneering work of Kay Nimmo at the International Tin Association in achieving practical solutions to the challenges of responsible minerals sourcing. Kay has worked tirelessly over the past decade to create and implement industry-leading initiatives which achieve real impacts, including the ITSCI programme to resolve conflict mineral concerns, and more recently the tin industry Code of Conduct. WIM is a non-profit organisation dedicated to promoting the development of women in the mining sector who this year received 642 nominations from the industry worldwide for women considered inspirational, making the effort to go above and beyond their daily responsibilities. Kay was selected for the Top 100 listing based on criteria such as perseverance in the face of adversity and a trail-blazing approach. The 2018 edition of “Top 100 Global Inspirational Women in Mining”, co-sponsored by BMO Capital Markets, was launched at the Landsdowne Club, London on 15th November. Kay has led work on sustainability at the International Tin Association for more than fifteen years, becoming involved in mining through pioneering and growing the ITSCI responsible sourcing programme since 2008. ITSCI is now the leading initiative enabling large volume minerals trading from the high risk areas of DRC Congo and neighbouring countries in Central Africa while avoiding contributing to conflict and human rights abuses. The work requires high level detailed integration with governmental and industry frameworks as well as liaising with project partners and her team with day-to-day oversight of practical field activities and corporate membership. ITSCI has forged efforts to support women in mining in the region. Kay and her team at the NGO Pact Inc were considered by the Gender Resource Facility advising the Netherlands Ministry of Foreign Affairs to have achieved exceptional work in Africa providing an unparalleled example to the world for all stakeholders to learn from, follow and adapt. Now Kay is using her considerable experience and understanding of global mining practices and sustainability standards to create and implement a tin industry Code of Conduct. This new initiative, addressing wide ranging standards and supply chain performance is unique within the metals industry, and enables tin producers who are member of the International Tin Association to demonstrate leadership in progressively contributing to positive social, economic and environmental outcomes. Tin producers issued their first reports in October.